I first got to know Frank Clegg five years ago, back when the company was still Lotuff & Clegg. 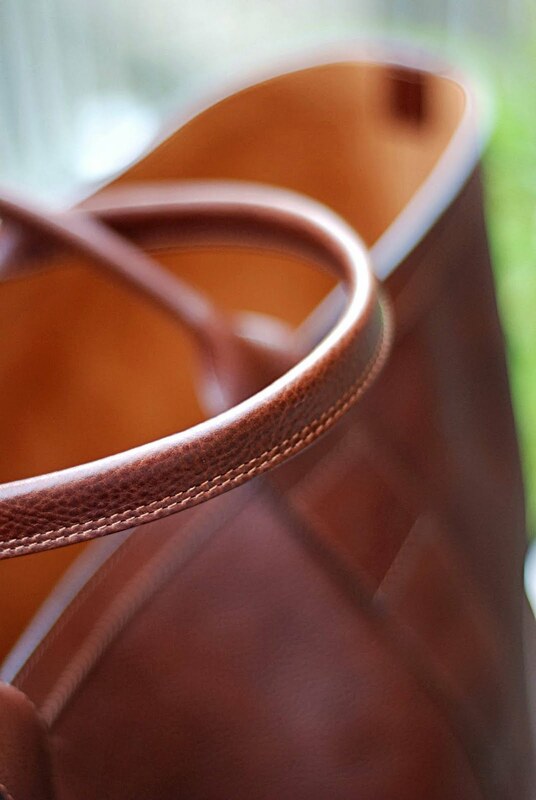 I bought a beautiful leather tote bag in 2011 – and have continued to recommend it ever since. Unfortunately Joe Lotuff, who I interviewed at the time, fell out with Frank and the two halves of the company went their separate ways. Lotuff bags are now sold online and in a few shops, but I (and most people I know) have stuck with Frank Clegg – the manufacturer and the designer of most of the styles both companies sell. It’s been great to see how the company has gone from strength to strength ever since. 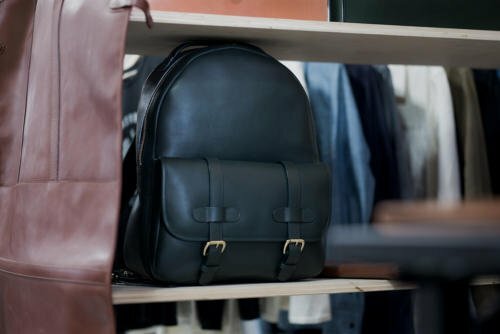 Clegg bags are sold by most of the specialty shops we love: The Armoury, Leather Soul, Double Monk, Linnegatan and now – as of last weekend – the new Leatherfoot in Toronto. They also just moved into a much bigger manufacturing facility in Massachusetts, increasing from 8,000 to 18,000 square foot. 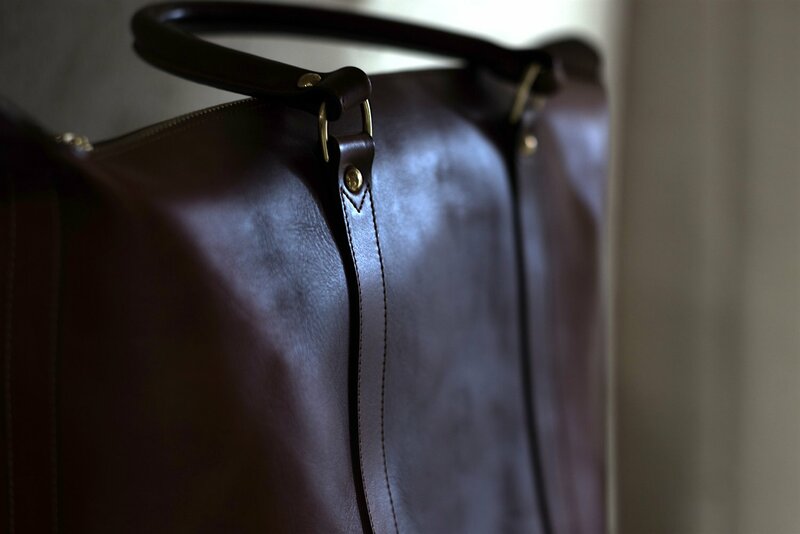 In England there is a strong tradition of bag making, but all derived from the saddlery industry – and therefore focused around heavy, oily bridle leathers and chunky hardware. Italy and France, by contrast, usually produce bags in treated and printed leathers, with flimsy zamac. For me the sweet spot is half way in between: natural, veg-tanned leather with minimal brass hardware. Simple, functional designs, with all the focus on the beauty of the materials. Which is what Clegg makes. 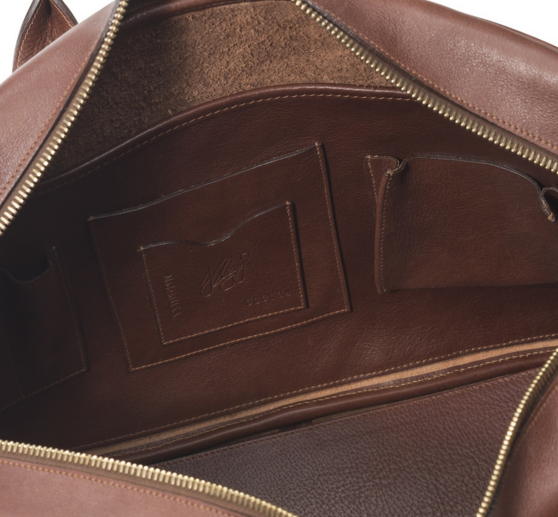 I often talk on Permanent Style about the finest examples of leather goods – often hand-sewn, with multiple rounded layers of inking down the seams. It’s what you’ll get from Hermes, or the top-end Dunhill line. This is the luxury side of the market, and continues to be what I recommend for those than can afford it. But it’s a very narrow and expensive area – for the majority of men out there, Frank Clegg is the perfect marriage of quality and value. Clegg’s Zip-Top Briefcase or Commuter Briefcase (above, top) are in many ways the perfect modern work bags. Smart enough to go with a suit, yet casual enough for a creative in knitwear and jeans, their versatility comes from a simple design and subtle tumbled grain leather. I know how well that leather ages because I’ve seen it on my tote over the past five years (pictured below). It will scratch, but then rub into the texture of the bag. If you were obsessive enough, you could track your time with the bag in these little nicks and scrapes, which gradually bed down into tiny tonal variations. The duffel bag (above, bottom) is the same aesthetic again, with Frank’s signature angled ends to the straps. Personally, I like all these pieces unlined, so you can see the reverse of the hide as well. Just with the addition of leather inner pockets. Back in January I had a long chat with Ian Clegg, Frank’s son, at Pitti Uomo. It was great to hear how positive he was, despite clearly some painful years in the past. “The move into new facilities will be great,” Ian said. “We have eight people working here at the moment but really need space for more. The team are innovating, but slowly – expanding into backpacks, more totes and more women’s models as the market proves there is appetite for them. But they’re not rushing or trying to grow too fast – as managers without a craft background tend to do. I look forward to using my tote for decades to come, and really want Frank Clegg Leatherworks to be around to help me look after it. You can follow the discussion on Frank Clegg bags – five years later by entering your email address in the box below. You will then receive an email every time a new comment is added. These will also contain a link to a page where you can stop the alerts, and remove all of your related data from the site. Very informative article! Unfortunately, I’m living in Southeast Asia, and carrying a full leather bag here can be cumbersome. Any chance of you having experience with Felisi bags? I’m looking for a smart, lightweight bag and most importantly it must be able to stand the wet weather. I’m afraid not, no. Unlined leather bags of this type are not that heavy though, and you do get much greater character to the leather with a bit of weight. I also recommend canvas bags from Filson, as you will have read, although they are a good deal more casual. I used my Clegg bag in Thailand for several years in all weathers. A wonderful accessory. Hi Simon, you have previously written about green as the third colour, what would you say about a Clegg travel duffle in green? Or would you rather advise chestnut/cognac for its versatility? Thanks! Thank you for the advice, Simon! Makes sense! Just one follow-up question: Would you put Frank Clegg bags on the same level or above Bill Amberg in terms of quality? or are they just too different? Thanks! 1. Are tote bags acceptable for men or they a bit girly? Simon, This is fantastic, and when it’s time for a new briefcase, I’ll be choosing between Clegg and JPLC, whose stuff I also learned about from you. I wonder what your experience with JPLC bags aging has been? I’ve had my Aviator in brown leather for two years and it’s aged magnificently, absorbing nicks and scratches, and quite able to to the office and on long, technical hikes in foul weather. I’m torn between the JPLC Perfect Weekender and one of the Clegg duffles for overnight trips. Great article as always – but I confess I started to focus on your jacket instead of the bags. Could you share what material that is? Looks fantastic. I am looking to order a Frank Clegg Tall Tote Bag. Will you recommend a unlined or lined version of it? Also, for the colour, should I take Chesnut or Chocolate? Interesting (and insightful) comparison between Frank Clegg and Hermes. Following your recent pieces on Chapal, I am wondering if there is a Frank Clegg in the leather apparel world, i.e. beautiful leather jackets constructed with quality veg-tanned leather and decent finishing, but without the unnecessary flourishes (like hand-stitched seams) that usually sink their customers neck-deep in diminishing-return? I feel there’s currently a noticeable lack of ‘affordable’ leather jacket reviews on this site at the moment, in contrast with the other menswear staples; a gap to be filled, perhaps? 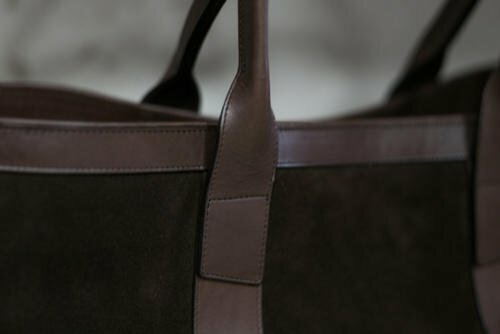 After seeing a number of articles on Frank Clegg bags and the excellent recent London photo series I’m going to take the plunge on a zip top briefcase in chestnut. Do you think pairing this with black/dark brown shoes is ok? Hi Simon, how do you feel about the weight of the duffle bag? I have one just like it in chocolate bridal leather and find it to be a bit heavy. It also scratches easily, but as you said it sort of fades away and sort of becomes part of the bag. Simon, which other brands (besides Hermès and Dunhill) are similar in quality, style and price? I’m currently looking to replace my old messenger bag which has lasted me a good ten years but is looking worse for wear. Based on what your articles a Frank Clegg bag seems like a wonderful investment. A question though, when you are picking a bag with the idea of it hopefully lasting 20+ years do you err on the side of it being slightly more formal or casual. I ask this because I bring my current bag everywhere and am stuck between choosing the English Briefcase or the Zip Top Briefcase. I currently work in a business casual environment but am only in my early thirties so formalities could rise if I move upward in my company. Would the English Briefcase be too formal on off days where I prefer to wear jeans and a button down shirt but still need to carry things around town? Hello Simon. I am thinking about getting the Hampton zipper tote in black for office and for going out. 1) Is the Hampton tote a classic style or a trend? I want something that will last years. 2) Would the Hampton tote be appropriate for both office and urban settings? I usually carry my headphones, Kindle and might use the tote as a weekend bag for clothes. 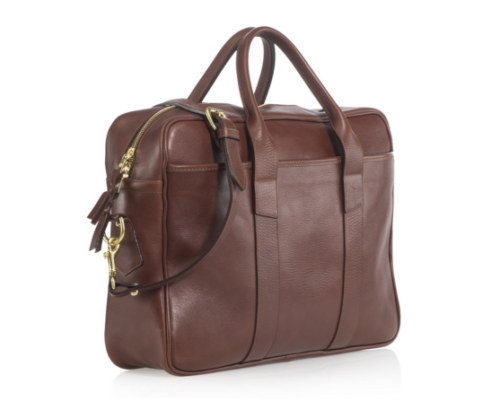 3) Would you recommend the zip top briefcase or the Hampton tote for my situation (e.g. to use in office and urban settings)? I am worried that the zip top briefcase might look a bit too formal with jeans and shirt. Thank you Simon. Also what is your opinion of this backpack for office and urban settings. And what colour would work best? I am debating between chestnut, chocolate and black. Thanks again. I wouldn’t recommend that for an office, but it depends a lot on what your office is like – on the colour too. Discovered your blog 3 months ago and have been reading historical posts since. I will be investing in some Frank Clegg pieces, first being the zip top briefcase. How important is it to match your leather carry to your shoes? 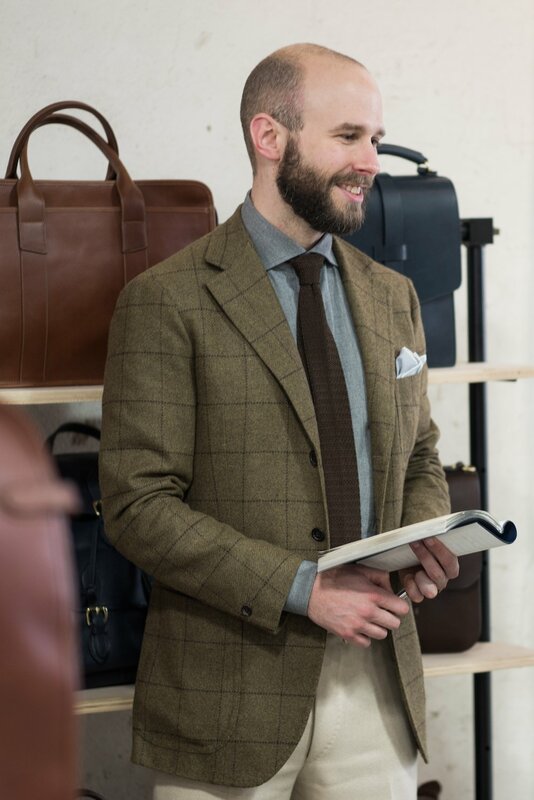 I really like the Chestnut color for the briefcase but tend to wear dark brown oxfords most days (an even black more frequently than you). How do you care for your leather bags? Do you polish them at all? Would you waterproof them using something like sapphire invulner? J panther ruc tote – Im eyeing this up based on your recommendation for them. In particular the black ventile version. How have you found yours? is it still in use? Are there any alternatives? at 645$ with potentially import and long delivery time, Im looking for alternatives if you have any recommendation brands? Yes I still use it, and it’s worn well. Have a look at this category for more bags. Thanks for the great article. Just a remark: I tend to find the handles used on the Frank Clegg’s zip top briefcase kind of long. It reminds me more of the handles on a (hybrid) tote or duffle bag, than those on a briefcase. And it might make the overall look more feminine. Do you have any comment on, or experience with, those lenghty handles on briefcases? Hi Simon, just wondering if have you seen the English breifcase up close if so how does it compare with the zip top ? For my needs (inclement Auckland weather) it looks more practical albeit less minimalist in looks. Many thanks. Do you think the bag is strong enough(especially the handle) to carrier a 15inch macbook pro? 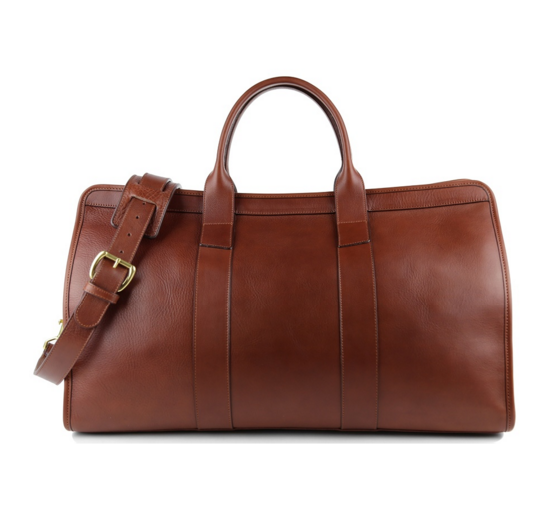 If it’s your first investment in a man bag, I’d definitely go for chestnut. Err on the darker side and it will be more versatile and there’s less chance you end up disliking it. Another style based question. I am struggling to choose between the zip top (single) (the Obama bag) and the English briefcase (or the small lawyer case). I am a corporate lawyer who almost always wears suits to offices and meetings. I find the zip-top lovely and practical and sleek but the English briefcase is wonderfully traditional. Any suggestions? Also what do you think of the shrunken byson leather? It looks wonderful on the site and certainly seems to have more character than the tumbled or bridle leather. I’d avoid the briefcase and the shrunken bison. Unless you already have two or three good pieces, you want a bag that will be incredibly versatile, and go with everything.